That would be “rain”, which is what is falling from the sky in Prague today. It didn’t really slow us down because in the wake of yesterday’s ambitious touring, we decided to take it easy today. Our first stop was the National Museum of Decorative Arts for the purpose of seeing the photography exhibition of Josef Koudelka, an outstanding and near-legendary Czech photographer whose name you may never have heard but whose work you have seen. He’s the guy who took all those famous street photos of the Soviet invasion of Prague in 1968. It was an enormous exhibit displaying hundreds of works — all in black and white — from over Koudelka’s 60+ year career. He’s currently 80 and still working… and collecting awards by the bushel. (I don’t know who the visitor is in this picture; Alice was in another room at the moment.) If you have any interest in photography at all you owe it to yourself to learn more about Koudelka and look up his work. He’s amazing. Alice correctly observed that it was a lot cooler in motion than standing still. And that’s about it for today, which was our last full day here. We return for a stopover overnight in Reykjavik late tomorrow evening, then return home Tuesday afternoon. For our penultimate dinner in Prague tonight, we went to…. a Thai restaurant. Czech food is fine but is heavy on things like lamb and venison and wild boar and such, accompanied by five different kinds of bread and potato dishes. We were getting a little dumpling’ed out so went to a Mexican restaurant last night, one run by actual Mexicans, which was excellent. If you’re wondering how and why Mexicans came to Prague to open a restaurant as opposed to, say, San Diego or Omaha, the answer is complicated. Some of the owners and staff came as students and stayed; others skipped over the US (I can’t imagine why) and emigrated to Canada, then came to Prague from there. Restaurant prices, by the way, are about 20% cheaper here than they are at home in the DC area. So Prague generally seems like a bargain. St. Vitus Chapel at Prague Castle contains the sepulchers of both Saint/Sorta King Wenceslas and Saint John of Nepomuk. You’ve never heard of Nepomuk but he’s got a good story: in the late 14th century he was said to be the confessor for the queen of Bohemia. (This is unlikely to be true for reasons that I will not bore you with.) The king was the jealous sort and demanded that John reveal the queen’s secrets. But unlike Paul Manafort and Michael Cohen, John of Nepomuk refused to dish to the authorities. So the king had him drowned. Three centuries later, his body was exhumed and his apparently intact tongue — the one that he held, so to speak — was found in his skull. Wow! Miracle! Canonize this guy right now! So they did. Three centuries after that, the Catholic Church — who should have known better — allowed a forensic analysis of the tissue and it was discovered not to be a tongue at all, but rather a mummified glob of brain tissue. But hey, once you’re a saint, you’re a saint. No take-backs. Speaking of Catholics, there aren’t enough of them here to fill the churches. Nearly 80% of the Czech population either identifies as “no religion” or refuses to answer the official survey questions about it. 30% declare themselves full-on atheists. The Catholic population, nearly 40% of the population as recently as 25 years ago, is now down to 10%. So this translates into a lot of empty churches: one that we visited had been donated by the local diocese to their Greek Orthodox counterparts, who were apparently able to make better use of it. Prague loves to claim Mozart as a sort of adopted favorite son, even though he never really lived here. He did visit several times for extended stays of a month or two. But interestingly, Prague contains one of the very few harpsichords that is known for certain to have been played by Mozart. It’s a “George Washington Slept Here” sort of thing. Weather permitting, probably the last thing we will do tomorrow is visit the highest point in Prague: the Petřín Tower. At 63.5 meters (208 ft) tall this would not seem to be a strong candidate for the designation, but the trick is that it sits on top of a 318 meter (1043 ft) hill overlooking the city, so its observation deck is actually 382 meters (1252 ft) above the river. That’s taller than the Eiffel Tower… which is not a coincidence, because the Petřín Tower is a nearly exact model of the uppermost 64 meters of the Eiffel Tower! This bit of architectural weirdness gives the Czechs an opportunity to thumb their collective nose at the French. Since we are flying out tomorrow evening, I expect that this will be my last blog post from this trip, which began nearly three weeks ago. It’s been another great trip. Next up is a visit to our friends in Arizona in about 6 weeks, followed by our return to Hawaii in February. Life is good! …is not Mount Everest. Though it is a bit of a cheat: Mount Everest, at 29,029 ft (8848 m) is indeed the highest mountain on Earth above sea level, but it sits on a plateau that is itself at an elevation of a good 15,000 ft (4500 m) or. So measured from its base to its summit, Mount Everest is a surprisingly second-rate 14,000′ (4300 m) tall. That statistic, of course, is rather cold comfort — emphasis on the “cold” — if you are actually standing atop Mount Everest trying to breathe. No, the tallest mountain on the planet, as measured from its base to its summit, is Mauna Kea here on the Big Island. Again, you’ve got to be a little flexible with your definitions, because the base of Mauna Kea is the ocean floor itself, a good 15,000 ft (4600 m) below my feet as I type this. Mauna Kea’s summit is at an altitude of 13,796 ft (4205 m), which means that measured from base to summit it is roughly 29,000 ft (8800 m) tall. Mauna Kea also has the more personal distinction of being the most important geographical feature in my life because of the many observatories at its summit and the many nights (~200) I spent using them early in my career. At that time, in the early 1980’s, there were four major observatories plus a couple of much smaller telescopes. 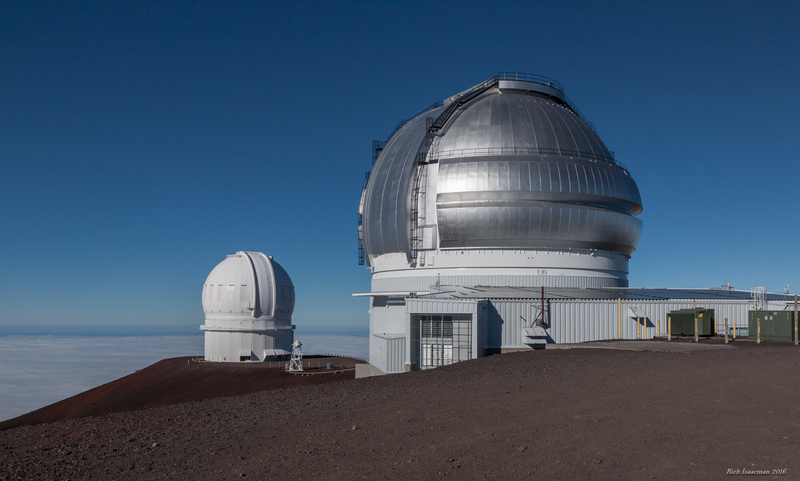 Today, there are a dozen major observatories and a whole lot of controversy about whether building any more constitutes a desecration of the summit, which has Hawaiian religious significance. But the current controversy aside, the mountain holds a lot of history and emotional resonance for me, and so it was important that we make the pilgrimage to the top. You first ascend via paved road to Hale Pohaku, the mid-level facility that serves as a visitor center and dormitory for the observatory engineers and astronomers. Hale Pohaku sits at 9000 ft (2700 m) which, given the weather patterns of the island, is typically where the cloud layer lives that traps the island’s heat and moisture below. It’s cold and dry above that point, which is why the site is the best astronomy observing locale in the world. 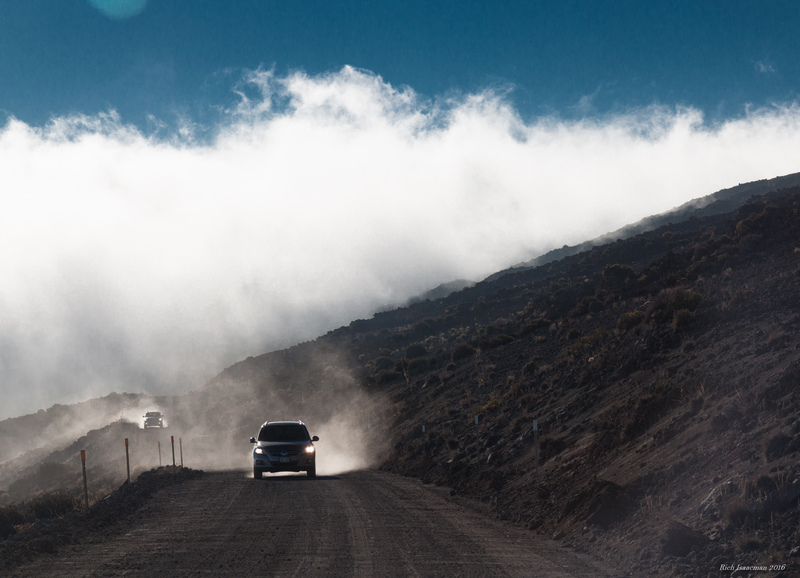 But that also means that you drive up through the clouds to get there. That’s Mauna Loa sticking out of the clouds at the center of the frame. It’s the same height as Mauna Kea, about 25 miles ( 40 km) to the south. It does not host any telescopes for the very sensible reason that it is an active volcano. The dome at the right side of the frame is the United Kingdom Infrared Telescope (UKIRT), where I worked for three years. It houses a 3.8 m diameter telescope. I’ll close with a few more scenes from our visit to the summit. The white dome at left in bottom picture is the Canada-France-Hawaii Telescope (CFHT), one of the older observatories on the mountain. The silver dome is the more recent Gemini telescope, so named because it has an identical twin sibling on an Andean mountaintop in Chile.